As a best-selling novel, Tony Award-winning stage production and Steven Spielberg’s blockbuster film, War Horse has vividly evoked for millions of readers and viewers the heroism and tragedy of First World War cavalry units. Now, Mirvish Productions in Toronto has gone a step further in the quest for authenticity. Its recently opened staging of War Horse at the Princess of Wales Theatre features a mini-exhibition of First World War-era cavalry and veterinary artifacts lent by the Canadian War Museum. War Horse, originally a 1982 novel by British author Michael Morpurgo, tells the story of a British boy, Albert, and his beloved horse, Joey, sold by Albert’s father to the cavalry and shipped to the battlefields of France at the outbreak of the First World War. Near the end of the war, Albert runs away to join the army and bring Joey home. 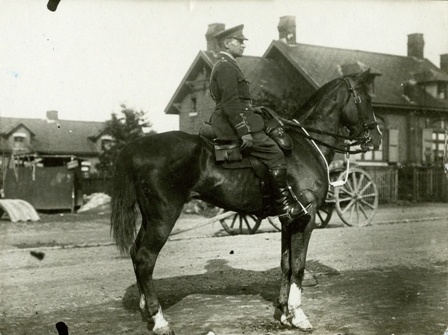 Morpurgo was inspired by meeting men who had fought in First World War British cavalry units. These units fought alongside Canadian cavalry, and the Canadian connection is reflected in the War Museum’s mini-exhibition. The uniform, weapons, tack and other equipment of a Canadian cavalry trooper and an Imperial German mounted rifleman are displayed, along with a Canadian army veterinarian’s surgical instruments and a box of shrapnel he pulled from injured horses. Machine guns, artillery barrages and heavily defended trenches limited the strategic value of cavalry during most of the war and made for appalling conditions for horses, as they did for soldiers. However, horses were essential for pulling supply wagons and guns through deep battlefield mud in which trucks were useless. More than a million Allied cavalry horses died from 1914 to 1918, mostly from disease or exhaustion rather than from enemy fire.